Odilon Redon (Bertrand-Jean Redon) was a French Expressionist/Symbolist painter and pastel artist whose career in the latter half of the 19th Century was marked by restless experimentation with spare compositions, intense colors and blurred images that suggest more than they reveal. His dreamlike excursions into shifting mists of color and soft suggestions of form and emotion anticipated the Surrealists fascination with dreams and unconscious imagery. His textured pastels, often collisions of half hidden shapes and lost edges, presaged the break up of naturalistic forms into geometry that would herald Cubism; and his brilliant intense clashes of undiluted color bridged Impressionism and Fauvism. Redon was also a lithographer, working in dramatic black and white works that seem to have emotional color under their surface, waiting to be released. He originally failed his entrance examinations for the École des Beaux-Arts, but later was admitted and studied with Jean-Léon Gérôme. In sharp contrast to Gérôme’s precise renderings, Redon’s images often blend recognizable forms with passages that dissolve into ambiguous intimations of subjects, vague hints of objects and scenes whose definition is left to be filled in by the viewer’s subconscious. Vasily Surikov (Wassilij Iwanowitsch Surikow) was probably the foremost history painter in Russia. He was active in the late 19th and early 20th centuries. Born into a Cossack family in Krasnoyarsk, Siberia, he studied at the Imperial Academy of Arts in St. Petersburg. Garnering awards and acclaim for his paintings, Surikov moved to Moscow, where he became friends with noted Russian artist Ilya Repin, and along with him, Ivan Kramskoy and others became an exhibitor in the traveling exhibitions by the Peredvizhniki (the Itenerants), a group of painters who chose to distance themselves from the Russian Academy. 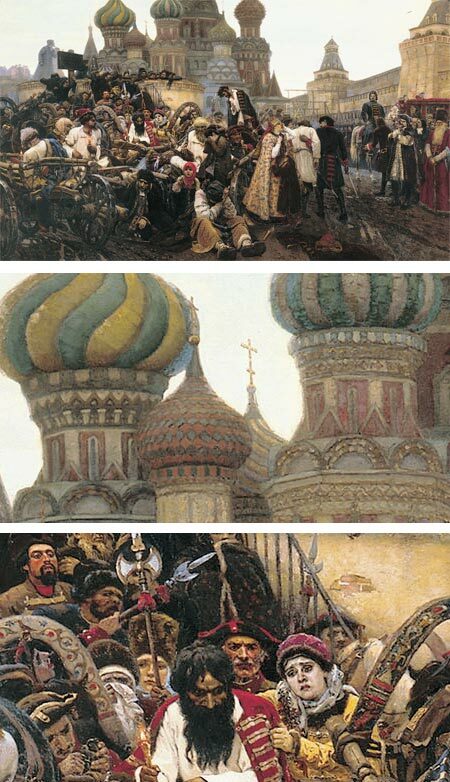 Surikov lent his brush to the portrayal of great Russian historical tragedies, political upheavals and the deaths of leaders and political figures, as in Morning of the Execution of the Streltsy by Tsar Peter I (image above, with details). Surikov would spend months or years gathering background information, costuming details and biographical studies; and producing multiple preliminary sketches to create his large scale historical works. He also often painted the same scene in differing sizes, either as a preliminary or as a variation on a larger or smaller version. He also produced many individual portraits, landscapes and watercolors. There is an official (I think) web site in Russian, but the links across the top are to galleries easily accessible to non-Russian speakers. Influential illustrator Bob Peak had an impact a generation of illustrators and helped define the design and format of modern movie posters. Active in the middle of the 20th Century, Peak transformed movie posters from staid photographic collages or glamour shots to expressive excursions into a variety of design directions, from detailed rendering to spare graphics to freeform watermedia. 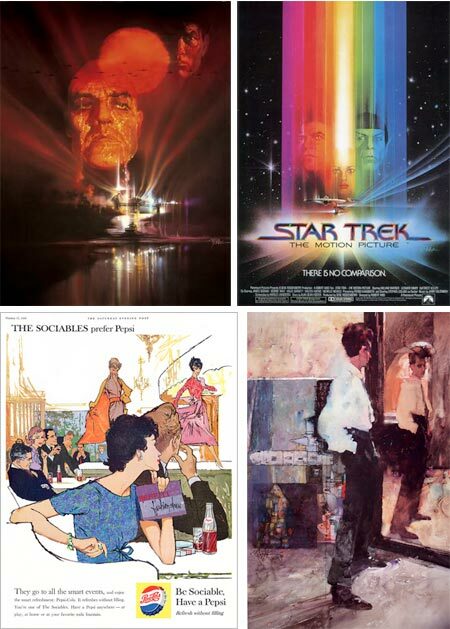 Peak did over 100 movie posters, starting with West Side Story in 1961, and created many memorable posts for movies like Apocalypse Now (above, top left), and the original Star Trek: The Motion Picture. He also had a number of commercial clients and did editorial illustration for a variety of magazines, including a series of highly regarded covers for Time magazine and TV Guide. In addition he did artwork for gallery display, such as his portrait of Expressionist painter Egon Schiele (above, lower right). The Society of Illustrators elected him to the Hall of Fame in 1977. Peak also taught at his own school, the Art Students League and Famous Artists School. Peak’s methods were as varied as his graphic approach, utilizing, oil, acrylic, charcoal and mixtures of them. He chose colors, textures and design approaches that he felt appropriate for the subject. Bob peak’s son Matthew Peak is also an artist and designer and poster artist of note, and maintains a web site devoted to his father’s work with extensive galleries. [Note: see addendum below.] There is also an official site. Leif Peng has a nice set of Bob Peak illustrations on his Flickr set. Gallery Nucleus in Southern California is hosting a major retrospective of Peak’s work titled Bob Peak: Father of The Modern Hollywood Poster. The show runs until June 25, 2009. 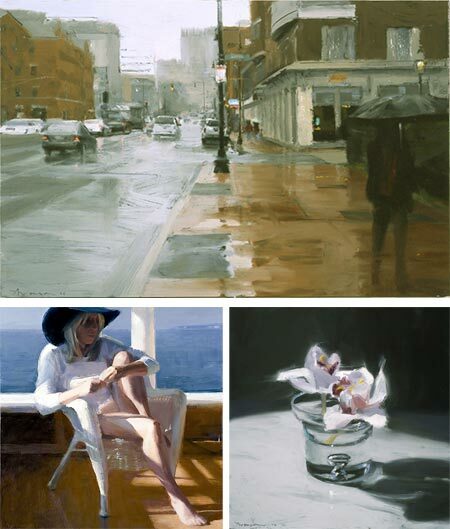 Two things strike me about painter Ben Aronson’s work, geometry and edges. The geometry is often prominent, as in his cityscapes and interiors, arrayed not only in the patterns of their own geometric intersections, but in the slashing diagonals of shafts of light and dark, punctuated with floating solids of sun and shadow. Aronson’s edges, on the other hand, are often subdued, softened and blurred so they are simultaneously clear and indefinite. You know without question that two shapes meet with an edge, you just don’t quite know where. This is most evident in his figurative work; though even here he places his figures within geometrically complex interiors. These elements combine with even more subtlety in is contemplative still life subjects, often simple arrangements of flowers in a glass, that are little marvels of light, shadow, shapes and playful edges. Aronson was born into an artistic family, both of his parents active as painters, and his father a well known teacher, as well as inheriting a lineage from his great grandmother who was a painter and illustrator. In addition to his family influence, and his study with painters like Phillip Guston and James Weeks at Boston University, Aronson takes inspiration from artists both traditional and modernist. His work is represented in a number of museums and private collections. 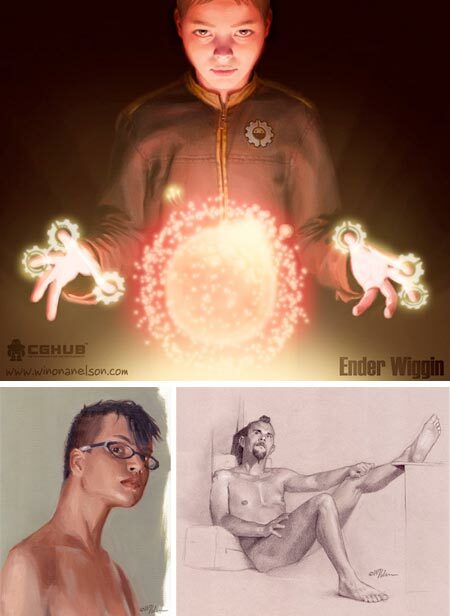 Concept artist and illustrator Winona Nelson attended the Conceptart.org Atelier, and currently works for Planet Moon Studios. She previously worked for Flagship Studios in Hellgate London and has done work for Wizards of the Coast, Platinum Studios and others. In addition to her concept art, character and object design and illustration, Nelson also does some comics work. 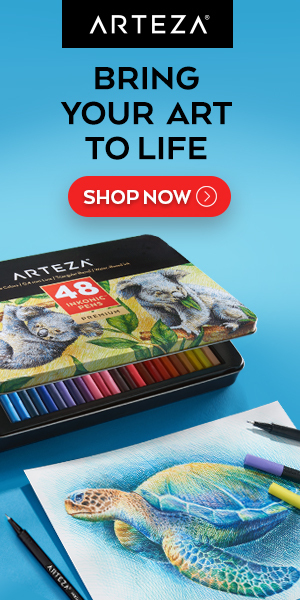 Her web site has example from various categories, but particularly of interest is the “Fine Art” section which includes some very nice figure drawings, cast drawings and portraits, including the self-portrait above, lower left. Nelson also maintains a blog on which she posts sketches, finished paintings and works in progress; and discusses her ongoing and upcoming projects. Mike Lester is a Georgia based illustrator and cartoonist who just received the National Cartoonist Society’s Ruben Award for Book Illustration, for his illustrations for Cool Daddy Rat, a read-aloud children’s book written by Kristyn Crow. In addition to his numerous illustrations for children’s books, Lester is an editorial cartoonist for the Rome News-Tribune, and also does a range of other commercial and editorial illustration. His web site includes a range of his cartooning, comic strips, characters and illustration, though it’s a bit disappointing that there isn’t more of his children’s book illustration featured on the site. 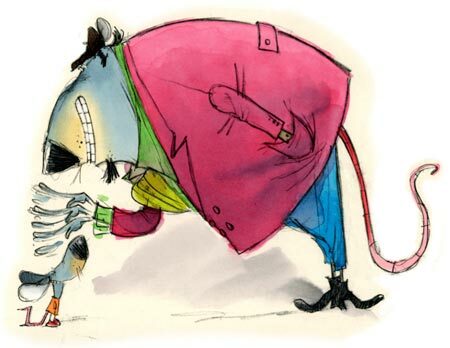 It’s in his loopy, sprightly children’s book characters that I find the most delight in his work.